Jake Jacobs, One of a Kind! 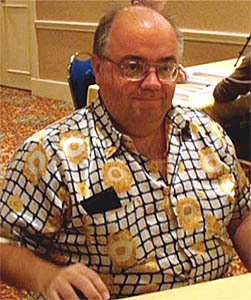 I am happy to pay tribute to Jake Jacobs, one of my oldest and best friends in backgammon, and one of the most interesting and intelligent people I have ever known. I asked Jake a series of questions and I will let him tell you about himself in his own words. I know this is long but, like everything Jake says and writes, it is well worth the time. I began playing in June, 1979. My younger brother, Munchkin, had been playing since he finished high school in 1972. He got good pretty fast, and by 1973 he made the semis of the Chicago Open the year that Timmy Wisecarver won it. He ran into Dean Muench at a tournament in Arlington Heights, and Dean turned him on to the North Club. This was during the years when Danny Rottman owned it, and it was the Chicago equivalent of New York's Mayfair Club. It was upstairs in an office building at 4777 Peterson, close to nothing in particular and deliberately hard to find. Like the Mayfair, the North Club was a bridge club where the city's best hung out to play rubber bridge. And because the best bridge players were there, the best game players gravitated to the place. So you had the best chess players (Craig Chellstorp and Greg Defotis), the best hearts player (Charlie Peres), the best gin player (probably Hal Mouser), and the best backgammon players. Timmy Wisecarver was the first really good player, but Craig, Greg, and Bobby Anderson came up quickly. I was driving cab during those years#151;actually, I was the night dispatcher most of that time. I'd finish work at 1:00 or 2:00 and drive down to the club sometimes. On Sunday nights there was a tournament at the Butch Maguires in Mt. Prospect, which was near where I lived in Des Plaines. The thing is, I never played backgammon. My younger brother was already really good, and I didn't feel like being second best in a competition with him. At Butch's, while they played backgammon, I'd play pinball, or later, video games. At the North Club, or at our house after Butch's closed, we'd play hearts, a game I was good at. Munchkin graduated from Columbia College with a theater degree and moved to Las Vegas to work as a dealer. Timmy Wisecarver and Craig Chellstorp followed him out there, and by 1978 Butch Maguire's no longer held backgammon tournaments. The backgammon boom, in Chicago and in America, was over. So you'd expect that I had passed up the chance to take up the game. But, as I've told the story elsewhere, in June of 1979 I was in a late-night joint on Milwaukee Avenue in Northbrook. It was a Greek-owned bar and restaurant called Captain's Quarters. I was trying to make time with the bartender, but she was busy and I was bored. One of the bar's regulars, a guy named Ray, had gotten a backgammon board from behind the bar and was trying to cajole his friends into playing. One of them pointed at me and said: "Talk to him, he looks like a backgammon player." I explained to Ray that he would have to teach me the game, but I'd kill some time playing with him if he did. After a couple of games he suggested we play for drinks. I still didn't have a clue how to play, but after six years of watching Defotis, Anderson, Munchkin, et al I knew what a good player looked like, and they didn't look like Ray. Besides, it was almost closing, so how much could I lose? I won three beers. A week later I was back, getting a lesson from George, the owner, when Ray showed up. The lesson George was giving me was in "doors," not backgammon, so Ray had to refresh my memory: I couldn't even set up the board. But I won four more beers. I practiced even harder the next week, and the fourth Friday I brought John, my coach. At closing George locked the doors and I played Ray for dollars while John and Ray played for fives. By dawn they had quit us forever. I never saw Ray again but John and I, and a group of friends, chouetted at Captain's Quarters every Friday night until I moved to Vegas myself in 1982. My first teacher was John Elliott, the one who loaned me Backgammon. In late summer we revived the Sunday night tournaments at Butch's. A few months later Howard Markowitz and Ida Weill opened Gammons of Chicago, where John and I got to play a better class of players than the ones we were drilling at Butch's. At the same time my brother gave me some of his backgammon booksDwek's, for instanceand I got Paradoxes and Probabilities and Vision Laughs at Counting as Christmas presents. Timmy Wisecarver was in and out of Chicago, and gave me some coaching and went over some unannotated matches he had, transcribed by Elliott Winslow, Nancy Laiderman, and some of the Ramwell (Butch Meese and Dave Cardwell) matches. In February of 1982, my brother called up asking if I wanted to play blackjack for a living. Did I mention it was February? Hmmm: twenty below versus sunny and seventy? Tough callnot! Besides, after eight years I had long since reached the apex of my learning curve at the cab company and was on a slow slide to stagnation. Las Vegas was the finishing school that took whatever promise I had shown as a player and turned me into a professional. For starters I was now rooming with Timmy and Munchkin. You may have heard of the Wisecarver Paradox? The way that came about was that Timmy had a five-hundred page computer printout from Dean Muench's bearoff program. He read it, and noticed that one set of equities was out of whack, that if you made play A and staved off a redouble you were worse off than making play B and getting redoubled. Think about five hundred pages of equities, about reading through it and spotting something like that. So I had an obsessive like that as a roommate. That five-hundred page printout was part of the legend. A friend once described our house. "I was hungry, so I went to the fridge, and all that was in there was a bottle of water, six Heineken bottles, each half empty, and a box of Junior Mints. I opened a cabinet, and there was this huge computer printout they told me had something to do with backgammon. I opened the rest of the cabinets and there was nothing but bridge books, hundreds of bridge books!" That was only part of it. The blackjack team I joined was not winning. Bad management was a factor, but the big problem was that we were unlucky. I should know: I was the big loser. I begged people to tell me what I was doing wrong; they'd watch and tell me my play was just fine, I just never won. This went on for months, so that even when things turned around we were digging out of a hole. I made less than two thousand dollars from the team that year. I've always been a competitive player but, with no income, the money I won from side play on Sunday nights at the Jockey Club meant the difference between TV dinners at T.G.I. Friday. I was focused. "There's this drug, it's a truth serum like Sodium Pentothal, but not Sodium ..."
"Scopalamine! That's it! Ohmigod, I can't believe you knew that. You're a genius! You have to edit my magazine!" That's the conversation, verbatim; that's how I became a backgammon writer. I think if we gave Max some of that Scopalamine it would turn out that it was a only ploy: he needed someone to edit the Las Vegas Backgammon Magazine, and flattery went a long way. Editing the magazine meant that I got to read Max's library, then the greatest in existence. There were something like 102 books then known in English, and I read all but three. In his files were almost every magazine and newsletter, as well as articles that had never been published, by everyone from Captain Cube to Ed Thorp, the PhD who discovered card counting. I also got the benefit of Max's insights, and he knew more about backgammon than people gave him credit for. I also got my first students and, as is often true, the teacher learned more than the students. Finally, there was Craig Chellstorp. Henry Watson was running an annual, sometimes semiannual, event known as the Plimpton Cup, aka the World's Amateur Championship. First prize was a hundred thousand dollars, and as the name implies it wasn't open to players like Craig. A win of $2500 or more was enough to end your eligibility. Craig isn't well known today, but at the time he was considered by his peers to be one of the ten best players. He gave a series of semiweekly seminars over a three month period that was enormously beneficial. I didn't cash in the Plimpton, but a year later came in second to Joe Russell in the Cavendish Invitational. Seven months after that I won the first Nevada State Championship. In the years since, I've benefited from the computer revolution. I have also been lucky enough to have conversed with almost every great player of the past quarter century. Two in particular I'd like to mention. He was a busy man, and didn't have much time for the obsessive study that marks almost every big time player. Yet he was a top player. As laid back as Howard was, his brain was always in high gear. When he had something to say about a position it was never idle chatter. In 1995 I decided to write a book about doubling strategy, and was lucky enough to team up with Walter Trice. Walter finally began to receive his due after his Gammon Village columns, and his book, Backgammon Boot Camp, reached a wide audience. He was already one of the game's best theorists when I collaborated with him. The partnership lasted slightly over a year, and I learned much. Another might be "body of work." Fish is around 130 pages; I've written more than 1500 pages of backgammon material by now. I've had some notable tournament successes (the answer I think you were looking for), including 2nd in the Japan Open and 1st in the Super Jackpot recently, or 2nd in the Peachtree Cup and 1st in the Georgia Masters, or cashing in four events at one of the Illinois State Championships. But the one I am proudest of is winning the U.S. Open. The World Cups were considered by most to be the best, most prestigious events ever held. The U.S. Open had every World Cup entrant who lost before the money, plus another several dozen players who couldn't make it for the full week. There were seventy-six players the year I won, and most of them were in the top hundred in the world. I got obsessively into bridge in 1983, and over a two-year period read 150 to 200 bridge books and 400 magazines cover to cover. I didn't actually start playing it until 1984 (I was just reading the first year) then won Nevada State Rookie of the Year. I have played Scrabble off and on for about the same span as the other games. I got to be pretty decent; I've had a national rating as high as 1600 or so. In the late eighties I was playing it as much as I ever did, and thought about plunging headlong into the game. I thought that with a couple of hours study a day I could get to be a top player in a couple of years. But I was trying to learn Korean at the time, and it came down to one or the other. Study Scrabble, and tiles get laid; study Korean, and Jake gets laidno contest. I married my long-time girlfriend, Ta, in January of 2008. I have a daughter, Sasithon (we call her Ben, but she doesn't like it), who turned five recently. My dad was a lawyer, and my mom an actress. He was an outstanding trial lawyer, specializing in marriage and family law. She was a member of the three main professional unions: SAG, AFTRA, and Actor's Equity. Among other credits she costarred with Joan Allen and Laurie Metcalf at Steppenwolf in the first play Gary Sinise directed, a World War II drama about Canadian women called Waiting for the Parade. I am the oldest of three boys. Number two, the aforementioned Munchkin, is also a blackjack player, and is in the Blackjack Hall Of Fame in Barona, California. He has been in and out of the movie business. He and I cowrote Ring Of Fire, a kickboxing love story, which he directed. He has written, directed, produced, edited, or appeared in dozens of others. Bruce, the youngest, is a vice president with First American Title and Trust in Tucson, Arizona. He's the white sheep of the family. My education has been sketchy. Our junior high science teacher asked my class what we wanted to be when we grew up. I was the only one to answer "sixteen-year old dropout." And I was the first to achieve the dream! I hadn't anticipated I would be dropping out of a university by then, but it was Roosevelt U I dropped out of. I bummed around for a year, it being the hippy era, and 16-year old university dropouts not being valued by prospective employers. Then I went to a computer school, and worked at that for a few years. I went back to school and got an associate's degree from Oakton Community College. I set a speed record there as I entered with no credits in March and graduated in August. I then went to the University of Illinois's Circle Campus, intent on becoming a philosopher, but rising at 5 a.m. for morning classes, then delivering pizzas at night and staying out until 3 a.m., eating white crosses in between to stay awake, burned me out. By then I was twenty and it was time to settle down so I went to work for the cab company, staying there for the next eight years, until I moved to Vegas. I read a lot, always have. When I am home in Singapore (I am on the road all the time, mostly to Tokyo), I try to take an afternoon break, hit the gym, then swim some laps (we have an Olympic pool in my complex) and dry out in the sun while reading. Plan? For the future? I didn't get where I am today by planning, so why change? I'd like to see more young people playing. I'd also like to see more people in Singapore playing. Right now, counting me, there is, uh, me. Nack Ballard is arguably the best player who ever lived. I don't know that he is necessarily the best player currently playing the game, though I don't know that he isn't. But Nack has also been classed as one of the best for nearly as long as Paul, even though he is a decade younger. Until Andreas Martens won the six hundred thousand dollars prize in the Million I am fairly sure that Nack had won more tournament money than anyone. He cashed something like three times in the ProAm, won more money than anyone else at the last World Cup through winning multiple events. He won a World Championship in Vegas years ago. He has won countless major events in Vegas since then. Overall I would estimate his lifetime winnings as approaching half a million dollars. I go to this length enumerating his tournament wins because he is primarily thought of as a money player. I've watched him stuck hundreds of points, and plus hundreds of points, and he is formidable no matter how he's doing, which is why the other top players fear him. I'm a big fan of the Harry Potter series. The two best books of all time are Magriel's, and Danny's first one, Vision Laughs at Counting. The best recent book is probably Walter's Backgammon Boot Camp. One that might not hold up, but I really liked the format, was Reno 1986. I don't think there is a particular area, e.g., backgames. I tend to play too fast, which leads to errors. I don't have a special routine. When I was playing all the time I was already in a general state of preparedness. I ought to develop some sort of warm up now that I don't play every day, but these days I am so busy I doubt I'd be able to follow one even if I developed it. Earlier, when I was writing about Craig Chellstorp I was thinking about how he didn't like to have his matches recorded. He was one of many top players who felt that others might profit by studying their games, and wanted to control the profits. At the time most of us believed that the best players had their own style, that if you watched Kiumar Motakhasses you would see something very different than if you watched Joe Dwek. I don't think people believe that today. If you can't watch Craig, or study his matches, find someone else with a comparable (or better) error rate and study theirs. Put bags over their heads and what difference does it make if you are watching Mochy, or Karsten Neilsen, or Steve Sax? Drape a gunnysack over Stick Rice or Falafel and you have no idea what sort of foodstuff you are feasting on. Style is just a synonym for idiosyncratic errors. In one sense I think that is true. I do think that Steve and Karsten and Mochy and Falafel and Stick all play like each other, but that's because they all imitate the same style: Snowie's. In a broader sense I hope that style is not synonymous with error rate. It means there is more to learn, things the bots aren't able to teach. And it means backgammon can, like the old days, have flair. Bring back the days when playing like a robot is reserved for X-22, and the rest of us have to learn to play like ourselves. Could you give a short list of major awards or distinctions you have achieved in backgammon? Funnily enough, two of the biggest money prizes I've won were for 3rd place finishes: in the ProAm, and in the Super Jackpot in Vegas. What follows is a list of first place finishes that come quickly to mind. Given time I could name others. US Open, Nevada State Championship, Thai Open, Midwest Championship, Chicago Open, Star Online Cup, Georgia Masters, Land of Lincoln Masters, Pittsburgh Open, ABT Player of the Year, Thailand Super Jackpot, Japan Super Jackpot.